Whether custom-built or store-bought, adding an outdoor bar to your backyard makes it even easier to host a great summer party. But there is plenty to consider when it comes to planning your backyard bar set-up. Keep these things in mind when you’re planning to buy or build an outdoor bar this summer! Chances are that you already have a picture in your mind of how your outdoor bar should look. But a bar isn’t a just pretty piece of furniture; it should work for you and your guests. Aside from barstools and the bar itself, the centrepiece of an outdoor bar is the bar fridge. After all, what’s the fun of an outdoor bar if you have to step indoors for a refill? However, not just any fridge will do. A fridge for an outdoor bar must be rated for outdoor use. Outdoor bar fridges have more insulation and more powerful cooling components to maintain the temperature in a fluctuating outdoor environment. Outdoor bar fridges are designed to resist the elements, with a rust-proof finish and weatherproof electrical components. Outdoor bar fridges are generally smaller than their indoor counterparts, ranging from 3.3 to 4.4 cu.ft. Most mini-fridges and beverage centres are not designed to function in fluctuating outdoor temperatures. The components will quickly wear out as the fridge works overtime to keep up with the cooling demand (and may not keep its contents cold enough regardless). Outdoor bar fridges are designed to withstand the great outdoors, but where you place the fridge within the outdoor bar set-up will impact its efficiency. Place the bar fridge away from direct sunlight to reduce energy use and prolong the life of the cooling components. Add an umbrella or an awning to create a shaded area if your outdoor bar is not under a roof. Keep some distance between the bar fridge and bar to allow for proper ventilation. Check the product manual to see how much clearance the fridge requires. Never place a bar fridge next to a BBQ. Both appliances expel heat, so placing them together puts additional stress on the fridge’s components. Plus, for safety reasons, you don’t want guests kneeling or bending near the BBQ. 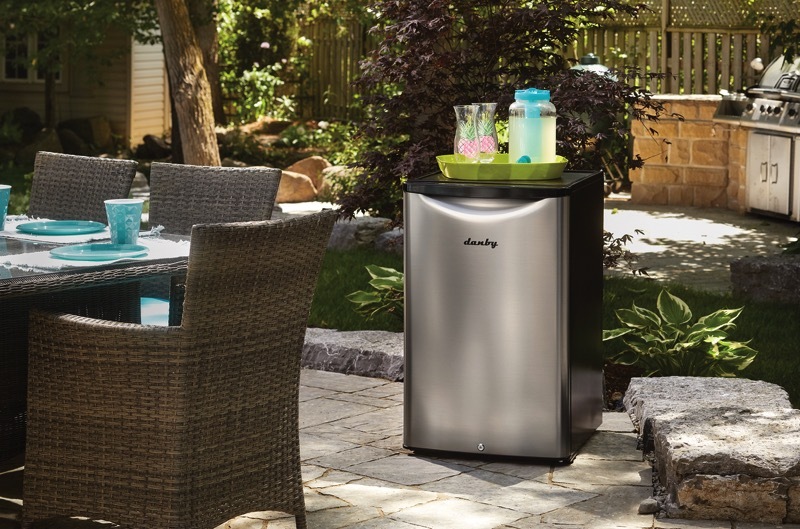 Put the right fridge in the right place, and your outdoor bar is set for years to come.